It’s all on the inside.. 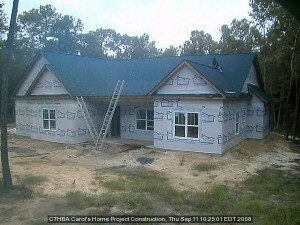 Things were really busy this week at our Carol’s Home project, but you may not have noticed from the webcam.. because all of the work was being done inside. We saw the following vendors working their magic; Carolina Central Vacuum Systems, Home Telco (they did the whole house wiring / network / intercom / camera, etc) and MoldStoppers. I also went with the Armstrongs to meet with the folks at Jilco in Mt. Pleasant, where we picked out bathroom cabinets, countertops and sinks. We also met with Premier Lighting to pick out some of the interior and exterior lighting. Next week we will see some action on the outside of the house as G&S and James Hardie install the siding. Insulation installed by Cohen’s Drywall. We will also see the drywall go up thanks to Dolphin Builders and Lowcountry Drywall. Make sure you keep an eye on the webcam. Have a great weekend. American Roofing Concepts is back on the roof today and is expected to finish the roof today or tomorrow at the latest. Jordy will be on-site with the electrician (EDC) tomorrow (Friday). HVAC has been completed by Andersen Heating and Cooling. Stairs to Frog– I am waiting on a call back from Southern Staircase to see if they have measured. Garage Door – Leon at Southeastern Garage Doors will go by the house this week and let us know about a delivery/installation date. Sheetrock – LowCountry Drywall has measured and is ready to install the week of September 22nd. 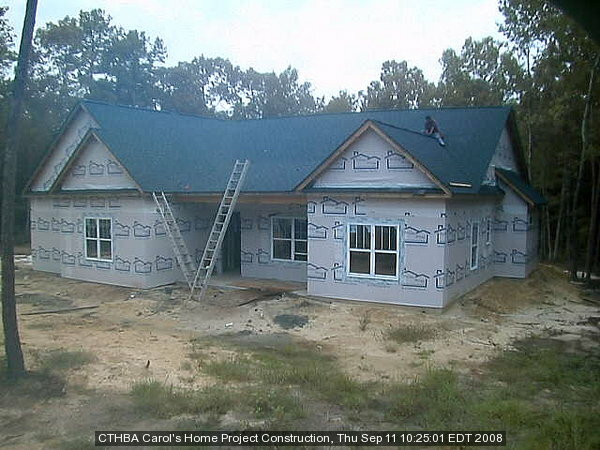 G&S/James Hardie – G&S should be measuring this week and will soon after place an order with James Hardie. Kitchen Cabinets – Welcom has gone ahead and placed the order. The cabinets should be here in a couple weeks. Granite – MVP has decided to upgrade us from Benissimo squares to 3cm granite slabs.